When I was a little girl, I had a little toy kitchen. A tornado took it away. My youngest brother has no memory of this storm, he being just a toddler at the time. I can still see the flattened garage in my memories. I wonder now how bad it really was - was it bigger in my child's eyes than in reality? I could ask my mother, and trust her memory, but I prefer mine. It took my kitchen - that's all that matters. & searching for funnel clouds. the absolute green darkness of the outside. sitting in the wonderful, wonderful dining area/studio space of an old apartment, drawing. Gorgeous light outside that grew darker & darker. that one had, in fact, touched down in a small town 7 or 8 miles away. Only then did I look up & see the green of the sky. She was from The North & had no real experience of such things. & the sky & felt we were okay. We were. Some were not. Another memory, a bit earlier. Drawing again - this time for a school assignment. Different apartment with less wonderful light, but a gorgeous blue roof. a tornado was down the road 4 or 5 miles & headed my way. No safe place in that apartment, on a flimsy 2nd floor. I took the photo of my then-boyfriend, my purse & headed for my parents' house. With the wind, so to speak. A later memory, while working at a camera store. The color of that sky became a drawing. & I was in the back room with my boss & a friend who'd stopped by. She too was from The North & had no real experience of such things. She required a couple of Valiums. I was just happy we were next door to a drugstore with a coke machine & candy bars. Even later - this job, this business. oohing & aahing at the heights achieved by some. Another customer called to let us know that a tornado had touched down a couple blocks away from us, behind us, not in our field of view. I called him, only to find he'd just been hit. giving him time to shut the door behind him as he ran for shelter. I am no longer as brave about these things as I was when a child. The loss of my little pink kitchen was my first awakening. But I can & do watch & listen to the sky. It speaks to those who will listen. I am not an adrenaline junkie AT ALL, but I have always wanted to see a tornado in real life. At a fairly safe distance of course, but at a distance where I can see it in detail. I am a lover of storms, and this, to me, would be the ultimate. And to see a green sky? How wonderfully ominous! Nature...she's so wondrous, and sometimes downright scary. The power of nature is incredible and it always makes me feel so small and humble in comparison to its strength. Amen to that! I am a want-to-be storm chaser. The sirens go off, my family heads to the basement, I head outdoors much to their horror and dismay. Tornadoes are so impersonal. They don't care who they hurt or where they go. It's VERY humbling. I've never been in one, just close, and it's pretty amazing. The sky color is just a little scary cause you know what could be forming. It's usually accompanied by absolute stillness before the wind. Oh, your little pink kitchen! My inner little girl is very sad for your inner little girl because I had a pink kitchen too which just baked itself in the California sunshine years after I stopped playing with it. 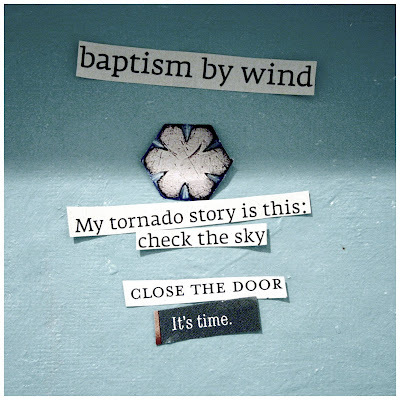 You reminisce about tornados the way we do about earthquakes. I have only been in the Midwest once in my whole life, and the day before I went home, the sky literally turned GREEN (I had NO idea such a thing could happen) and my friend very nonchalantly said, "Oh, yeah. This is tornado season." To say that I kind of freaked out (inside my mind) is a bit of an understatement. I think you are very brave and I enjoyed the way you presented your memories here. Polona - I imagine I would not be cool at all in an earthquake or landslide. I'm not VERY cool under a tornado warning - I just take it seriously & pay attention. D - OMG! I'm so glad it didn't stir up while you were actually skydiving. Although what a sight that would be! Wow! oh yes, yes now i see it must be alright for me to chuckle a bit .. i just read your response to Darlene's harrowing sky diving near miss incident. you say: "what a sight that would be!" and i say: "what a ride that would be! eeekk!!" i grew up in the prairie country of the midwest. i don't have stories i remember. your pink kitchen. another winning anecdotal story my friend. i know, i know you really did lose a pink kitchen. i;m sorry for you but it would have been a lot less interesting of a story had you lost a framed photo of that ungrateful boyfriend. I have a wonderful tornado drawing I must post one day. It's my very favorite drawing & I will never sell it. I too love the way tornadoes look, their power, etc. - I just don't want anyone to be hurt by one.